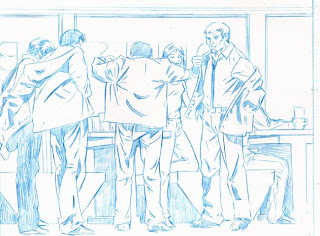 Not shown much of "Six Months" except for the first page, 'cause I wanted to finish all the pencils to the first issue. Well I've finished, and here are various panels from said first issue. Not much action I hear you cry, but this issue is a slow burner and there were only a couple of scenes where it all kicks off and I didn't what to show them just yet. I'm crackin' on with the inks and lettering and a couple of weeks should see this one done. 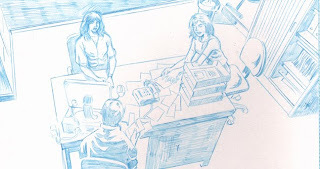 Jim O'Hara (The writer of this epic) has sent me the script to the 2nd issue and I've just completed the layouts to that, and let me just say that there is plenty going on in that one. He's certainly stepped up the action scenes. Should have loads of fun with that. I've sent copies of the pages to Jim and Insomnia Publications and every one seems happy with it, so it's full steam ahead. AND a couple of pin ups I've promised people, it's gonna be a busy time. someone might get the impression you love drawing, gary. love the top and last two panels; the angles you've chosen and the use of shadow. VERY strong staging and composition, much impressed. now get back to it! ps;don't forget to fit me in your schedule for all that cake. First time I saw this I was sweating not to spill beer all over it. Can't wait to see some finished stuff. There will be inked pages posted soon.